n.3	 Grappa "del mè" / "d'or"
In this three spirits I bottle my "history" of distiller, in this bottles there is part of my life I spent in distillery and all my knowledge of distillation. What a better name than "Historiae", Latin for history, the history of Pilzer distillates. 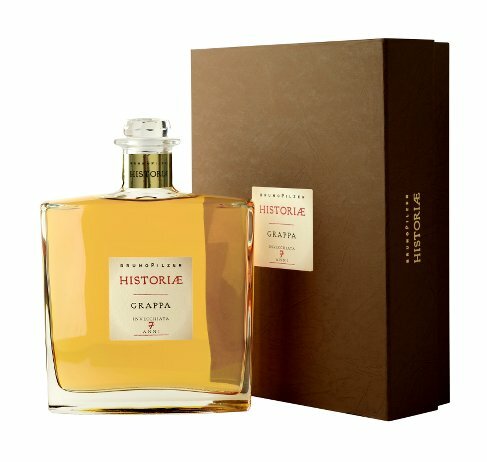 Historiae Grappa Invecchiata 7 anni, this is a selection of the longest aged Grappas from our barriques. We blended accurately Grappa from different French oak barriques, all aged for 7 or more years. The wood helps the Grappa to express its maximum delicacy combining the fresh perfume of marc Eau-de-vie with the flavours of wood.